All workshops will be held at Burnham Overy Staithe Village Hall, New Road, PE31 8JQ, on the North Norfolk coast. Time: 10am till 4.30pm. £50 per person. I usually take up to 10/11 students each workshop. I regret that I am unable to give refunds but if you have to cancel I will do my best to rearrange it for you. All welcome and suitable for all levels. 18 yrs plus. 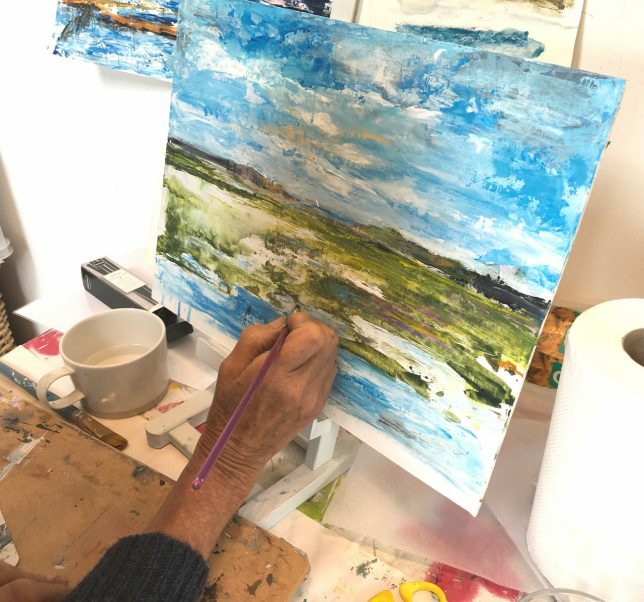 Enjoy a day of creative play using mixed media inspired by the beautiful North Norfolk coast. 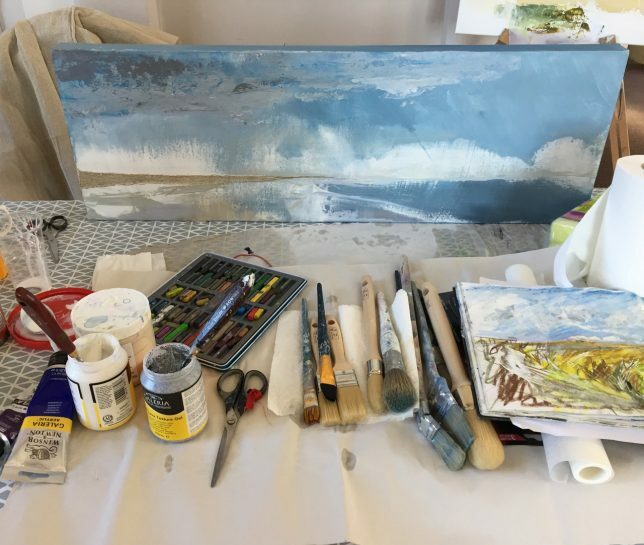 With an emphasis on painting techniques, demonstrations and one-to-one tuition, this one day workshop will give you the freedom to express your creativity through mark making, mixed media, colour mixing and fun! As a trained art tutor, I have taught in high schools and adult education for several years. I now enjoy teaching mixed media classes based on my techniques to help and encourage others to develop their own artistic journey. 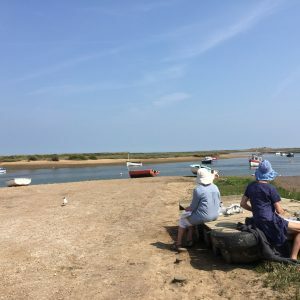 The first part of this workshop is all about sketching and observing the contours, light and colours around the harbour and staithe. 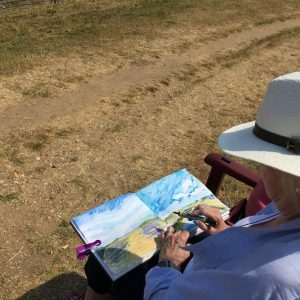 The aim is to learn how to use a sketchbook for capturing expressive marks, to free up your thinking and mark making as you engage with the atmosphere of the place, before returning to the hall for lunch. 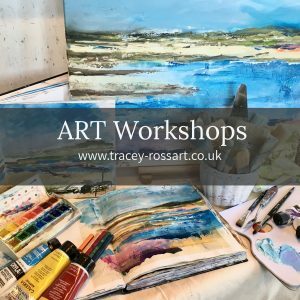 After lunch, I will give a group demonstration on how I enjoy taking a sketch into a painting, using many of my own techniques, such as adding various different mediums to your paints, how to create valuable textures using tissue paper and a palette knife and much more. 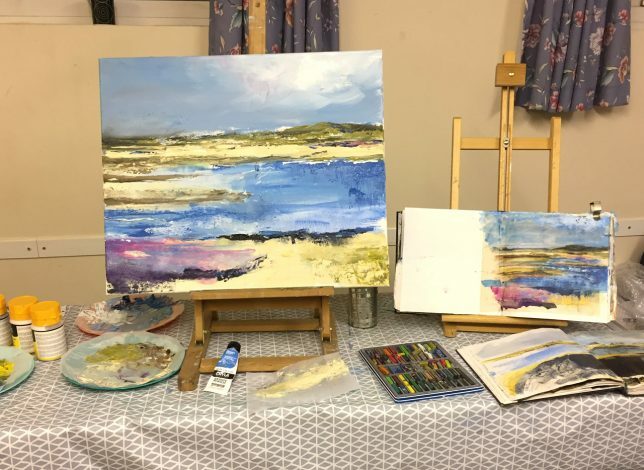 After the demonstration, everyone will have the opportunity to create their own painting inspired by their sketches with lots of support and one-to-one tuition along the way. Each workshop is £50 per person and includes some basic materials. Refreshments are available throughout the day with tea, coffee, soft drinks, biscuits and homemade cake. All students will be sent a materials list once the booking has been confirmed. The hall is perfectly situated just a short walk from the harbour with beautiful views over the salt-marshes. The hall is suitably equipped with a kitchen, large hall, disabled toilet and parking either on the road or on a grass recreation field opposite. One to one tuition and art demonstrations.